The High Line Canal presents a rare opportunity to provide stormwater quality management by re-purposing the historic irrigation channel. 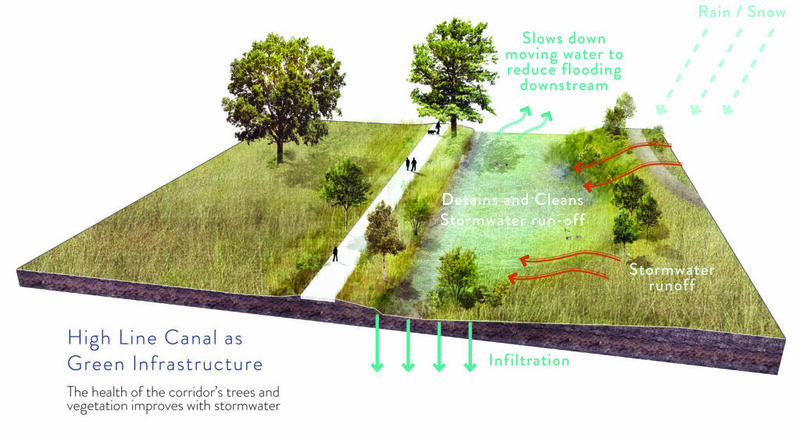 The Stormwater Transformation and Enhancement Project (STEP), led by the High Line Canal Conservancy with the support and expertise of its partners, Denver Water, Urban Drainage and Flood Control District and jurisdictions, will bring a new life and renewed utility to the Canal – as a green infrastructure system. This system will allow for low impact treatment methods and movement of water along many parts of the 71-mile-long Canal. Stormwater is rainwater, snowmelt or even water from a garden hose. Stormwater runoff is the portion of stormwater that runs off a surface – such as driveways, parking lots or rooftops – and flows into storm drains and eventually into our waterways. Stormwater runoff from urban areas is a significant cause of environmental degradation of our waterways. In Colorado, some unmanaged stormwater pollution runs directly into surface waters, including lakes, streams, and even into the High Line Canal, without any treatment.